Adorable Chinese bears aren't known to frequent the Rocky Mountains, but on Dec. 31, 2010, a Colorado farmer delivered the next best thing: a miniature panda calf. 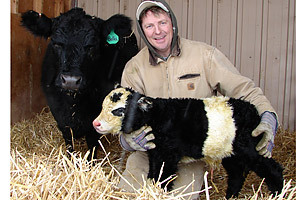 The rare bovine, named Ben, has black ovals around his eyes and a white belly. He's one of only a few dozen panda-colored minicows in the world, and owner Chris Jessen is hoping to sell him into some collector's menagerie for about $30,000. A few decades ago, scientists viewed the "miniature condition" (tiny cows grow to be a few hundred pounds, while common cows can weigh up to 4,000 lb. [1,800 kg]) as a lethal genetic fluke for cows. But today the animals are bred as novelties and pets, and some pint-size bulls are even used for junior rodeos.